A mix of French impressions and Buddhist ideologies, Luang Prabang promises a rejuvenating getaway. Luang Prabang, Laos -- No visit to Laos (its official name is Lao People’s Democratic Republic) can be complete without a visit to Luang Prabang, which was the capital of Laos for many years till the Pathet Lao dismantled the monarchy and shifted the capital to Vientiane. It is a sleepy little town near the confluence of rivers Mekong and Nam Kham. 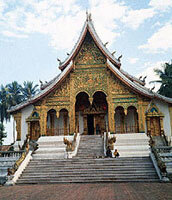 << Luang Prabang: The town has many ancient Wats or Buddhist shrines. Most of the attractions are within walking distance which is why it is a pleasure discovering this heritage town with its ancient buildings and mansions of the French colonial era as well as a number of Wats, some in need of urgent restoration. Besides surrounding hills and forests, which add a touch of greenery, the town has lovely walks along the river bank where people can enjoy the tranquil scenery. For those across the river, motorboats are the only means of transport to commute to the town. French influence is felt in the names of streets as well as the buildings and mansions of the French colonial period. Laos is a Buddhist country of the Theravada sect, as evidenced by a number of Wats in the town. Monks are ordained early and they remain celibate. They occupy a high status in society and people bow when they pass by. They are more than willing to offer alms to the monks and think it is their duty to do so. Wat Xieng Thong, a ‘Golden City Temple’ near the Mekong river, is the town’s most magnificent Buddhist temple. Built by King Setthathirat in the 16th century the temple enjoyed royal patronage until the monarchy was ousted in 1975. The Wat is typical of Laos’ Luang Prabang architecture with impressive curved roofs, dazzling paints and a ‘tree of life’ mosaic. Richly decorated wooden columns support a ceiling that depicts ‘dharma wheel’ as enshrined in Buddhist legend. A small entry fee is collected for ongoing restoration efforts. Wat Mai Souvannaphoumaram, (Wat Mai) , is of recent origin. Built in 1796, it was restored under the patronage of King Manthaturath in 1821. It has an impressive five- tier roof and bas-relief depicting scenes from daily life as well as scenes from Buddhist legends. The front veranda has decorated columns and there are gold relief panels on the door. It was once the residence of the Sangakharat or Supreme Patriarch of the Lao Sangha. There are other small and intricate Wats like the Wat Banpakham. The Royal Palace Museum is worth a visit for its exhibits showcase local history. The entry fee is 15,000 kip (approximately $1.5). Several religious objects and a collection of rare Buddhist sculptures from Cambodia, India and Laos are also on display. The pride of place belongs to exhibits connected with the monarchy — the royal throne, elegant furniture used by royalty, the king’s and queen’s rooms with all their finery, weapons, dresses, gift items presented by several national leaders, including Indian leaders. There are also fine paintings of some royal members. Phu Si is the hill that dominates the Luang Prabang skyline. It is fairly easy to climb and gives a commanding view of the town, the river and the surroundings. At the hilltop is a stupa, which has railings around it and intricate umbrella decorations. There is also a small cave temple, Wat Tham Phu Si. One can see the Luang Prabang airstrip and planes landing and taking off. The Nam Kham river can be seen clearly from this height, and there are small temples dedicated to Buddha on the other side of the hill. The Prabang Phoutthai Awanh shrine houses a golden coloured statue of a standing Buddha. Another shrine contains an idol of the Buddha in a reclining posture. This side of the hill also has a Buddha statue housed in a niche under a hooded Naga (serpent); this depiction of Buddha is sacred to Buddhists. All these heritage structures are in need of massive restoration efforts to restore their past glory. The traditional Lao dance has withstood the passage of time and continues to be performed at the National Theatre. For an entry fee of $8, one can enjoy a breathtaking Lao dance, both traditional as well as folk. The dance usually depicts a scene from the Ramayana or other legends native to Laos. The performance is marked by powerful vocal music as well as traditional drums and string instruments. The performers include men, women, boys and girls dressed in beautiful Lao silk and elaborate headgear. The folk dances are performed by tribal groups to accompaniment of drums and string instruments. The main street becomes a shopping centre after dark and hundreds of men and women set up tiny shops selling all sorts of stuff. Bargaining is the norm, done in a friendly and cheerful manner, with the language barrier overcome through the calculator. They greet you cheerfully with a broad grin and “Sabaai-Di”, which means “Hello/Goodbye”. A walk around the small town is like a voyage of discovery. There is not much traffic. Motorbikes and bicycles are used extensively and a few imported Japanese cars can also be seen. A visit to the roadside market is an interesting experience. Vendors sell familiar vegetables and fruits like tomatoes, beans, cabbage, brinjal, and even phudina, coriander leaves and green chillies. Raw tamarind and raw mangoes are favourite snacks! However, the scene changes when you enter the meat market. You might turn queasy seeing the dead bats with their legs tied and all sorts of insects offered, raw or fried, as delicacies, as well as varieties of fresh fish, pork and all types of meat. Rice is the staple food while wheat is used for making bread and related bakery products. Vegetarians, beware — even a harmless looking bun could have some meat inside! Laos is famous for its massages and foot massage is popular. The Lao traditional massage costs 35,000 kip (about $3.6) per hour. A half-day scenic trip to the waterfalls at Kuang Si, 29 km from town, passes through forests, dangerous bridges and small tribal villages. Water gushes down limestone formations into a series of cool, turquoise-green pools. Getting to the limestone cave at the base of the waterfalls involves a risky trek down the slopes. There are forest areas earmarked for tiger and bear conservation projects where poached animals are recovered and tenderly cared for. Short boat-rides on the broad river give visitors an idea of the life of ordinary Laos people, whose very life depends on the Mekong river. How to go: By air or road from Vientiane. It takes at least 10 hours by bus. When to go: November to April when the weather is clear and cool. Where to stay: There are many lodges/ hotels/guesthouses to suit all budgets. Cost: You can get a room for about $10-15. Food and drink is reasonably priced. Food: A large variety for non-vegetarians but limited choice for vegetarians. Bierlo is the `national' beer of Laos. Currency: kip ($1= about 9,600 kip). Dollars are accepted at most places. Language: Lao, which has its own script. A few speak and understand English and French.